This was an amazing episode of Monday Night Raw. This week of WWE Monday Night Raw was live from the Bell Centre in Montreal. Stephanie McMahon came out to kick off the show. Stephanie McMahon introduced her brother Shane McMahon. Shane McMahon called out Mike Rome to introduce him as "Best in the World". They both then started talking about Superstar-Shakeup. Shane talked about beating Miz's father. Miz then interrupted the duo and attacked Shane from behind. Miz stands tall after the end of the segment. Next, on Raw, The Revival teamed up with the War Raiders (now called as Viking Experience) to face the team of Ricochet, Aleister Black, Zack Ryder and Curt Hawkins. After some amazing action, The Viking Experience pinned Ryder to pick the victory for their team. Finn Balor came out next to face Andrade in a non-title match. After some hard and forth action, Andrade pinned Finn Balor to won the match. Elias came out next to perform his song but he got interrupted by Rey Mysterio who attacked and forced him to leave the ring. Lars Suvillian then made his way to the ring and destroyed The Master Of The 619 before leaving the arena. The team of Chad Gable and Booby Roode then came out and challenged the entire tag team roster. The Usos answered the challenge and defeated them comfortably. Alexa Bliss came out next for another episode of "A Moment with Bliss". Sami Zayn was her guest this time. Zayn got a huge standing ovation from the Montreal crowd but the Underdog from The Underground mocked the crowd before leaving the arena. Women's Tag team Champions, The IIconics, came out next to face the team of Bayley and Naomi but they failed to win the match against the duo. Next, EC3 came out to face Braun Strowman, but the Monster Among Men attacked him even before the match started. He continued attacking EC3 and finally choke-slammed him through the stage. Becky Lynch came out next to face Ruby Riott and beat her comfortably after locking her in the disarmher. After the match, Sarah Logan and Liv Morgan tried to attack Lynch but The Man attacked both of them. Natalya then made her way out to the ring and challenged Becky Lynch. Lacey Evans then interrupted them and announced that she has officially become a member of RAW and then faced Natalya for an opportunity at Lynch's for RAW Women's Championship. Lacey Evans beat Natalya and became the No.1 contender. 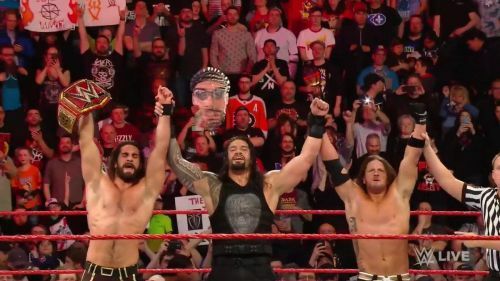 In the main event of this week's Raw, the team of Bobby Lashley, Drew McIntyre and Baron Corbin faced the team of Roman Reigns, Seth Rollins and AJ Styles. After some incredible action, AJ Styles pinned Bobby Lashley to pick up the victory for his team. We UNIVERSALLY hate the name Viking Experience.